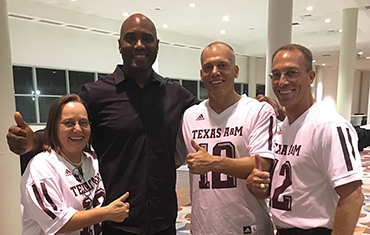 Quentin Coryatt ’92 has teamed up with the Houston A&M Club to offer a unique fundraising opportunity by doing something most Aggies do every single day. Drinking coffee. Simply go to Spirit Coffee. Choose your coffee. Select your recipient. Send. Drink up! You’ve given back. Spirit Coffee sends a portion of all proceeds to the organization you select. Quentin built Spirit Coffee on his foundational belief of giving back. Throughout his careers, Quentin has always emphasized the importance of a quality education, coupled with service to others. As a coffee lover, Quentin believes that something as simple as starting the day with a cup of coffee can help others. That’s what makes this fundraiser so easy. From giving back, through the ritual of having a morning cup of coffee, to the time honored traditions of Texas A&M, selfless service is always Quentin’s style and can be yours. It is a way of life for the eternal Aggie.